Most of the elements of good boat design are readily apparent when looking at a boat. Among them, one can usually fairly easily judge whether a power vessel is designed to be a true passagemaker, a good coastal cruiser, or possibly a fast boat for short hops in protected water. Michael Kasten. 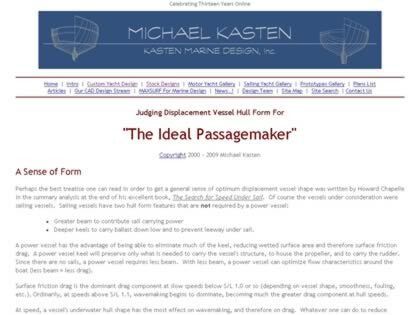 Web Site Snapshot: If available, above is a snapshot of the Ideal Passagemaker Hull Form web site at http://www.kastenmarine.com/ideal_passagemaker.htm as it appeared when this site was added to the directory or last verified. Please Note that Boat Design Net has no involvement with the above web site; all content and images depicted in the above thumbnail are the property and copyright of Ideal Passagemaker Hull Form unless otherwise noted on that site. Description: Most of the elements of good boat design are readily apparent when looking at a boat. Among them, one can usually fairly easily judge whether a power vessel is designed to be a true passagemaker, a good coastal cruiser, or possibly a fast boat for short hops in protected water. Michael Kasten.